What do we want from our health care system? The scope of activity that is required is very broad. We want people to live well by assisting them to make healthy choices, to be well supported by their local health care team, and to have access to specialised services and treatments when needed. Atul Gawande points out that the main challenge facing medicine has changed. This challenge is not to improve the ‘components’ of health care, but to build better systems for the delivery of care. The work of Barbara Starfield has demonstrated that the focus of a redesigned system needs to be strong primary care. The model of the ‘patient centred medical home‘ has repeatedly been demonstrated (1,2,3,4,5) to be the most effective and efficient way to achieve these aims. 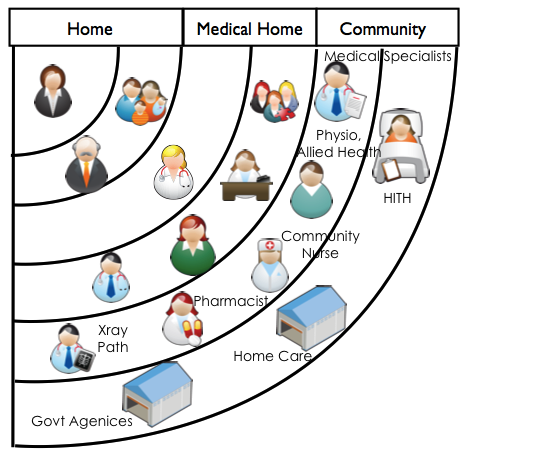 In the medical home model, a person and their family form a partnership with a particular primary care provider and their team, and other services ‘wrap around’ this partnership as required. In most cases, the primary care provider will be a general practitioner. In some circumstances, it may be another primary health care professional, such as an Aboriginal Health Worker or Remote Area Nurse. The health system needs to be designed to have the person and their individual needs at the centre. Better lifestyle choices and improved self-management skills are the key to better overall health outcomes. There is growing evidence (1,2,3,4,5) that people benefit from having an ongoing relationship with a particular trusted generalist provider. This relationship is supported by a practice team, forming the ‘Medical Home’. 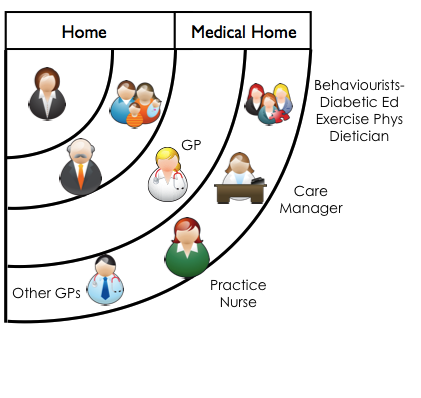 The RACGP definition of General Practice encompasses the characteristics of the Medical Home. General practice provides person centred, continuing, comprehensive and coordinated wholeperson health care to individuals and families in their communities. Wagner’s Chronic Disease Model emphasises the important of the informed motivated patient working in partnership with an available activated primary care team. To a very great extent, success in Chronic Disease Management requires skills in the management of multi-morbidity – the co-occurence of two or more chronic conditions in one patient. In the primary care setting, 50% of patients aged over 65 have three or more chronic conditions, and 30% have five or more. Better outcomes are achieved by taking care of patients, rather than disease-states. The Medical Home benefits from team members with new roles, including complex care coordinators and new allied health and health coaching roles. A practice nurse in the role of Care Manager is a very important new member of the Medical Home team. The Care Manager has a special relationship with each patient and with their usual general practitioner – working as a three-tiered partnership. One of the functions of the Care Manager is Care Coodination – aimed at achieving a ‘smooth progression of care from the patient’s point of view’. (ref).This is particularly important for the 20% of patients who are unable to self-manage. The role of care coordination includes arranging external services and consultations, ensuring timely two way communication, and facilitating logistical arrangements for patients. It requires a knowledge of local resources and the formation of relationships with both the patient and with a range of providers. There is also a growing role in the medical home team for ‘behaviourists’ who can assist people with lifestyle modification and self management skills. Exercise physiologists, diabetic educators and dieticians are examples of behaviourist providers. Some practices require additional tools, teams and skills to act as ‘full functioning’ medical homes. Sometimes this additional support can be co-located with the practice. Sometimes part of the medical home will be a ‘virtual’ integration, with team members linked to the practice via excellent communication, common goals, shared culture and strong relationships. As a person’s care needs increase, they benefit from extending their care team by adding new members. The expanded team may include medical specialists, physiotherapists, community pharmacists, optometrists, psychologists, and other allied health providers. It may also include community nursing, home care and personal care providers. The medical home acts as a gateway to these more specialised parts of the health system – making sure that patients can access the care they need, while avoiding unnecessary pathways or pathways where risks may outweigh benefits. The patient is always an informed partner in this shared clinical care decision making. The medical home has a special role in coordinating care, and in maintaining a source of accurate, consistent and complete clinical information about each person. Care from the patient’s point of view should feel ‘joined up’, or integrated. All members of the care team should be working with the knowledge of the complete set of goals for each patient, and be aware of their own role in helping to achieve these goals. When required, hospital based care should be accessible in a timely manner. The health system requires an efficient, effective, and safe hospital system to deliver inpatient services and emergency care. Over and above the provision of acute and/or highly specialised care, the role of the hospital is to support care in the community. Cost and safety are greatly improved when hospital based care is connected to ongoing community based care. It would be logical for the usual provider to be involved in the care planning for the patient at the time of admission, during the inpatient period, and at discharge – a ‘GP inreach program’. Each person benefits from partnering with a well defined care team. As their acuity and needs increase, this care team will expand to include different members. As acuity diminishes or better control is achieved, the team will contract. Therefore, patients are not transferred from one team to another team. The medical home always remains a central part of their core care team. The Primary Health Network works across the Home, Medical Home and Community ‘circles’ of the health system. Its aim is to make sure that every person and their family can partner with the care team that they need to better manage their health. The Primary Health Network improves access to services, and assists providers to improve capacity and quality of care. It has an important role in identifying and closing service gaps, particularly for vulnerable and disadvantaged people. The Local Health Network is responsible for safe, accessible, effective and efficient hospital-based care, including inpatient and emergency services, and to ensure that this care is integrated with ongoing community based care. It therefore works across the Hospital and to some extent the Community ‘circles’. To achieve person centred, continuing, comprehensive and coordinated care in the community requires the Primary Health Networll and the Local Health District to work in close partnership and to be well connected to other sector services and their communities. there is an improvement in cost of care – care is cheaper to deliver and more efficient. Each person to partner with a ‘Medical Home’ that can deliver comprehensive services for prevention, acute care and chronic disease management. Accessible, safe, efficient and integrated hospital services – that are required less often than they are now. Our aim should be to strengthen each layer of the health system to deliver optimal care – to make each of the concentric circles as capable as possible. 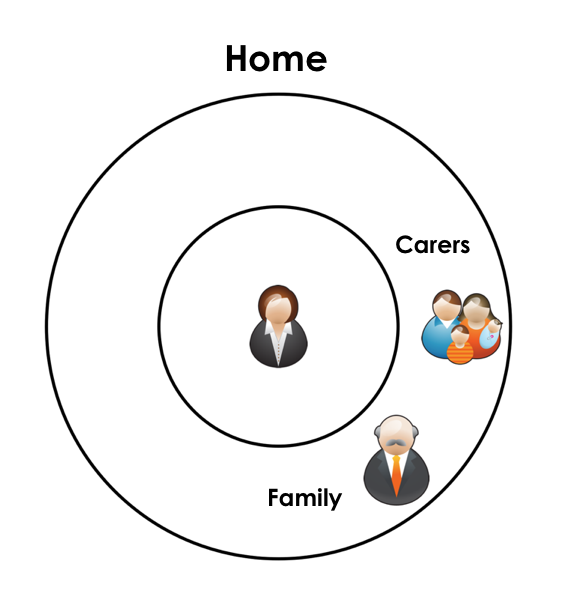 In a high-functioning health system, each person requires less care in the outer layers of the circle, but that care is readily accessible when required. If people ‘drift’ into receiving care in the outer circles inappropriately, it is detrimental to their own health outcomes, reduces the availability of specialised care when it is required, and escalates costs unnecessarily. Build a system, not a service. Creating services that do not fit in the existing relationships of the patient-centred model of care can disrupt the system and produce worse health outcomes. The most efficient and effective way to improve the system is to place resources as close to the centre of the circle as possible. It has been clearly demonstrated internationally that better outcomes and greater equity are achieved by health systems that invest in better systems of primary care. Continuity of care: an essential element of modern general practice? RACGP – What is General Practice? Primary care physicians and specialists as personal physicians. Health care expenditures and mortality experience. 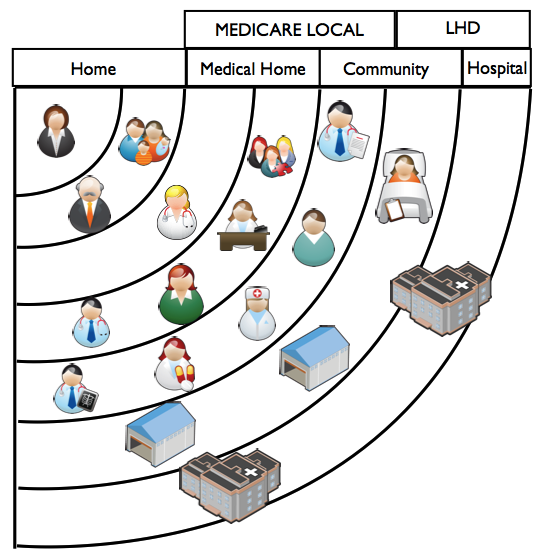 The Health Care Home Model: Primary Health Care Meeting Public Health Goals.Grant R, Greene D.